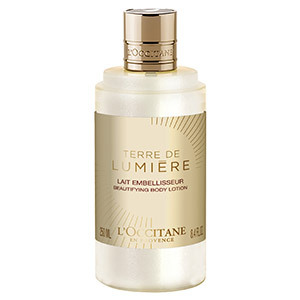 L'Occitane came out with a new fragrance, called Terre de Lumière and the scent is amazing. I love it. This is my favorite scent from L'Occitane. It is inspired by The Golden Hour, a unique moment in time right before the sun sets when the light embraces the sky. This new fragrance captures this special fleeting moment to make it last forever. It has zesty and aromatic top notes, this unique fragrance unexpectedly develops into delicate aromas of lavender, honey and almond from the South of France. What i smell most is the honey, it actually smells like honey to me. Enjoy a complete, delicious bath and body ritual that features the aromatic scent of the Terre de Lumière fragrance. The Shower Gel is completely indulgent, rich and full of decadent lather. It leaves my skin feeling soft and scented for hours with Terre de Lumière fragrance. The Terre de Lumière Beautifying Body Milk is inspired by the Golden Hour, a unique moment in time right before the sun sets when the light embraces the sky. 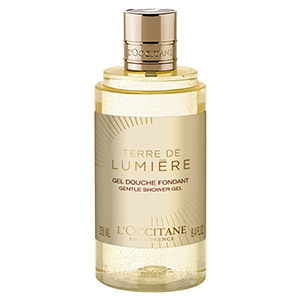 L'Occitane's new fragrance, Terre de Lumière, captures this special fleeting moment to make it last forever. With zesty and aromatic top notes this unique fragrance unexpectedly develops into delicate aromas of lavender, honey and almond from the South of France. Complete the Terre de Lumière ritual and moisturize your skin, with this body milk inspired by the fragrance. The body milk leaves skin scented like honey. its amazing. The scent smells like it could be poured over my morning yogurt. That is how much is reminds me of honey. It is delicious and beautiful. I adore this scent and will wear it often. L'Occitane is available online at www.loccitane.com or in boutique shops around the world. Like L’Occitane on Facebook: https://www.facebook.com/loccitane.usa; Follow L’Occitane on Twitter: @LOCCITANE; Follow L’Occitane on Pinterest: http://www.pinterest.com/loccitane/; Subscribe to L’Occitane on YouTube: https://www.youtube.com/user/loccitaneenprovence/featured; Follow L’Occitane on Instagram: http://instagram.com/loccitane# and Follow L’Occitane on Google+: https://plus.google.com/+loccitaneusa/posts.